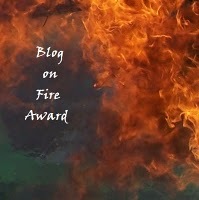 Yeah, I have just received the 'Blog On Fire Award' from the lovely Mrs J from http://www.modernwivelyhood.blogspot.com/ This is another new award to add to my collection, I am feeling very honoured lately from all these amazing bloggers linking up with me. It sure would be nice if the recipients then forward this award onto some more interesting bloggers. Some award givers like you to write something about yourself but I am passing on that one, but if the recipients want to do this then write away. If passing on the award it would be nice to notify the bloggers as soon as you have awarded it to them. It would be nice also if some of my followers popped by and showed these bloggers some support. Congratulations on your award...and thank you so much for the award, Karima!!!! :D You deserve it! I really appreciate it! Thank you so much for awarding me my first ever award. I feel honored! And congrats on the award yourself!! Awesome, thank you. :) And congratulations, to you! Congtrats! Thanks for mentioning my blog. You're creative. Congrats Karima! So sweet of you to pass it on to my blog! I joined your blog and just wanted to say hello!! I just saw you joined mine as well so hello and welcome :) I am sure I am going to find some awesome craft ideas on your cute blog...looking forward to tagging along! Congrats on the award and thank you for awarding me. I promise I will pay it forward soon.